The TV industry may be ecstatic about the 2016 upfronts, but it would be a mistake to view the TV ad market as resilient – let alone a growth business. Like every medium before it, the television will give way to newer, more capable delivery models. And the winners are unlikely to be the same. 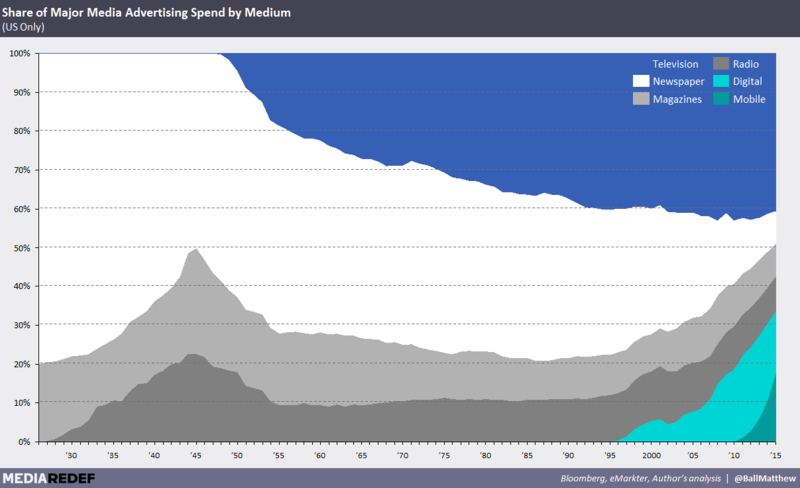 In recent weeks, a tremendous amount has been said about the healthiness of television ad spend. Many have argued it’s now (i.e. finally!) taking back share from digital thanks to the latter’s unreliability, unclear performance metrics and fraud. Naturally, the major television networks are abundantly happy about this hypothesis. The other half of their revenues (carriage), after all, is already locked in for years to come. Yet this optimism ignores substantial underlying problems. No matter how you define consumption, the industry is experiencing a dramatic flight from ad-supported television (whether linear or over the top). And though counter-intuitive, the severity of this trend has actually benefited the major network groups. The loss of audiences (especially young audiences) has created ad impression scarcity that has driven up primetime CPMs significantly over the past 18 months, even though the core product (a TV ad) remains the same and its efficacy continues to erode. The 2016 network upfronts further this argument. After two down years, the upfronts rebounded this year – and thus powered the “back to TV” narrative PR reps have touted nonstop. But this is mostly compensatory ad buyer behavior; those that didn’t invest heavily in the upfronts in 2015 ended up crushed in the spot market later that season (in part due to falling ratings). Many brands and buyers are now looking to hedge their exposure by bolstering early buys. And despite CPM gains, many networks have been cranking up ad loads and even speeding up content in order to create extra ad time (i.e. converting 22 minutes of programming + 8 of advertising to 20 + 10) to offset viewer declines. None of these are healthy trends. They more closely resemble a bubble than signs of resiliency. Still, TV has maintained its share of major media advertising at roughly 40% even as digital and mobile devoured more than a third. TV may have grown share were it not for digital, but, for the most part, ad revenue losses have been absorbed by every medium other than TV. 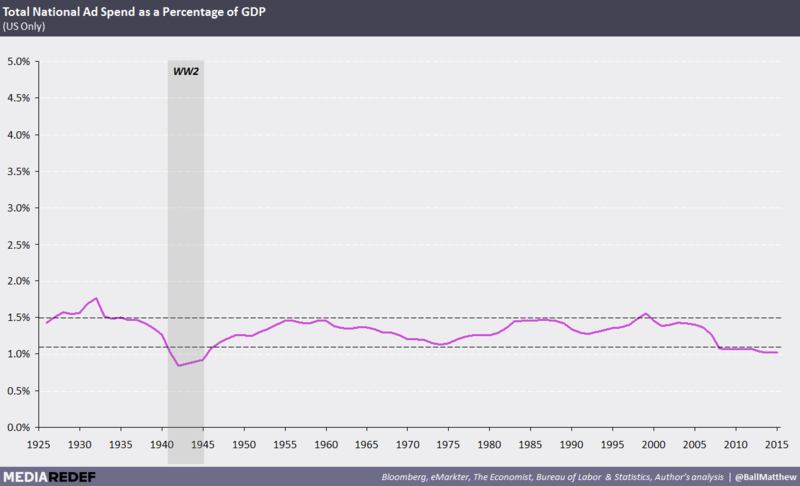 What’s so spectacular about this observation is that the US economy has undergone tremendous change over this period – from the composition of GDP (manufacturing has fallen from 15% to 7% since 1925, Financial Services have tripled 7%), to the makeup of the American population and unprecedented corporate profitability. Understanding that ad spend is largely a function of GDP is critical for anyone dependent on the ad business – especially given modest GDP growth estimates for the years to come. It’s also important to highlight that there’s been a significant lowering of this rate in recent years – hitting new record non-war lows in each of the past three years. This suggests unprecedented efficiency in industry-wide advertising. Digital (which again, is 33% of total spend) is no doubt a big part of this. Save for radio (which was invented not long before TV), every new medium has eventually overtaken those that preceded it. Core to this is the fact that these mediums – from periodical to dailies and television – have enabled advertising experiences previously not possible, including new ad formats, styles, timeliness and so on. Digital will be the same. Despite this, many like to claim it won’t. Or that it will, but not soon – and not in ways that fundamentally disrupts the model of old. As my colleague explained last week, this isn’t true. Not only is there no precedent to suggest otherwise, digital brings more capabilities and enhancements to the ad experience than any medium that preceded it. So much so that the entire marketing funnel will be fundamentally reshaped. This raises critical new questions: will these changes expand ad spend? Or through new efficiencies, drive its share of GDP even lower? Who will benefit and/or capture the value? The first pair is hard to answer, as either side could easily be rationalized. The third, however, bodes poorly for today’s media incumbents – even if they manage the transition of audiences from linear to online. As of Q1 2016, Google and Facebook own more than 60-65% of total digital ad spend – and drive more than two thirds of all domestic growth. Third place, Yahoo, has only 4% (down from 9% in 2010) and all remaining players have less than 1.7% each. This is, of course, a dramatic shift from today’s advertising model, where a roster of competitors share relatively even portions. It is, however, very consistent with digital competitive dynamics, which follow a power law distribution: 1st place is exponentially more valuable than 2nd, which is exponentially more valuable than 3rd, and so on. Furthermore, this distribution hints at one of Big Media’s core problems. Historically, they attracted audiences and advertisers by making great content. Not only is great content in abundant supply, “great”, “produced” content isn’t what’s driving these revenues. It’s mostly highly fragmented user generated content and much broader social activities, such as messaging and event planning. And although Google and Facebook thrive in part because of the content that does run through their systems, they monopolize digital ad spend because of their unique technologies and capabilities (e.g. intent-based targeting). What’s more, there aren’t many that could ever assemble the audience and technological scale to do the same. And if content creators want to work through them (a la Facebook’s Instant Articles), they shouldn’t be surprised that the toll is steep. This, in turn, hints at the “in either case” answer of whether digital ad tech will expand or shrink ad spend’s share of GDP. During the company’s Q1 2016 analyst call, Facebook COO Sheryl Sandberg boasted that “SMBs are able to use the pull of some of the biggest brands in the world [on Facebook]. So over 2 million SMBs have posted a video, both paid and organic, in the last month. And that happens to be many times the number of SMBs that have shot or placed a TV commercial.” If the ad spend pie does grow, it’s unlikely to be with today’s content creators. The television ad ecosystem may be optimistic today. It shouldn’t be. No platform can dominate forever. But that doesn’t mean their business is over, just that it needs to change.